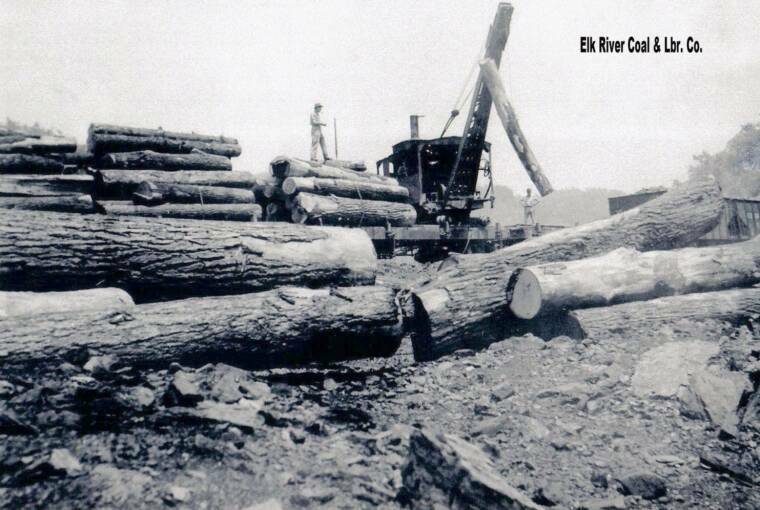 There were two activities operating under the ERC&L banner...the logging activity out of Swandale and, in the later years along the Lilly Fork, and the gob operations at the Rich Run Mine in Widen. The rolling stock, what little there was is divided into those two groups on this page. If the assumptions above about the first caboose are true, the caboose that appears in the majority of photos from the 1950's and 1960's we could call the second caboose. It is shown in the two nice color photos taken by David Marquis. According to Ed Kirstatter's research, and confirmed by Bruce Elliott at Cass (see below), this is a B&O Class K-1 unit to which the B&O added the loop feature on the handrail. 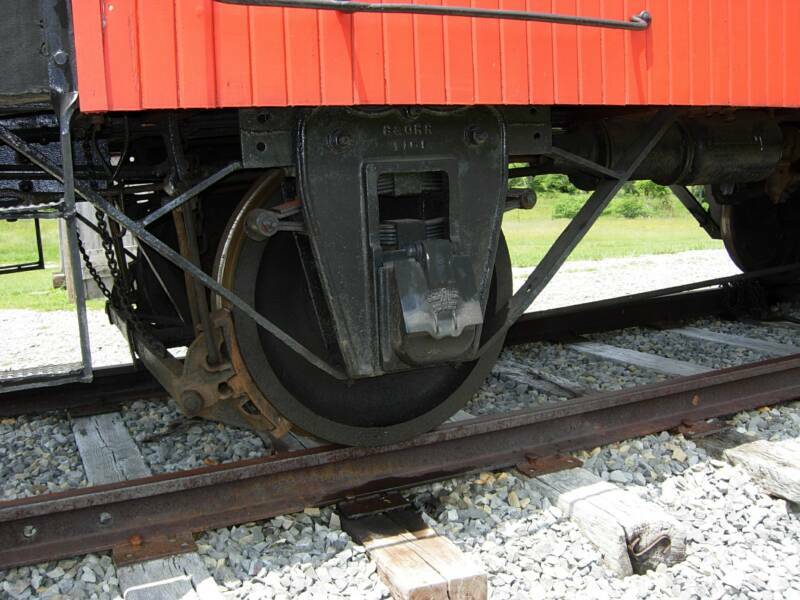 The fact the side grabirons have a tight bend also indicates this is an ex-B&O unit. The K-1's had a 11'-0" wheelbase and a 16'-3" length. (see insert b/w photo of B&O K-1 #1180 at the bottom of this section along with a drawing of the K-1 cars). Fortunately for BC&G fans, the second caboose (based on the end rail and siderail configurations, has survived and is on display at Cass Scenic Railway in fully restored condition. Careful study of the photos reveals that the diagonal rod braces on the ends visible in the Marquis' "in service' photos are not present on the restored car. Apparently the restoration resolved any 'matchboxing' issues! The nice Marquis photo above shows one of the truss rod flats in MOW service in the late 50's or early 60's. 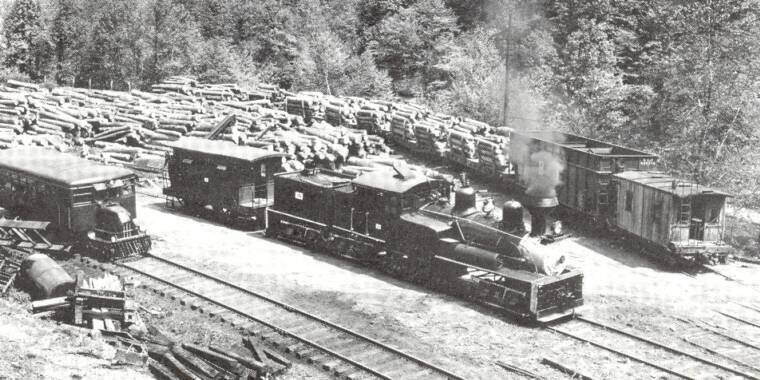 A photo on page 35 of the Warden BC&G book appears to show three of these truss rod flats on one train. Exactly how many of these cars were in service at any time is not known. 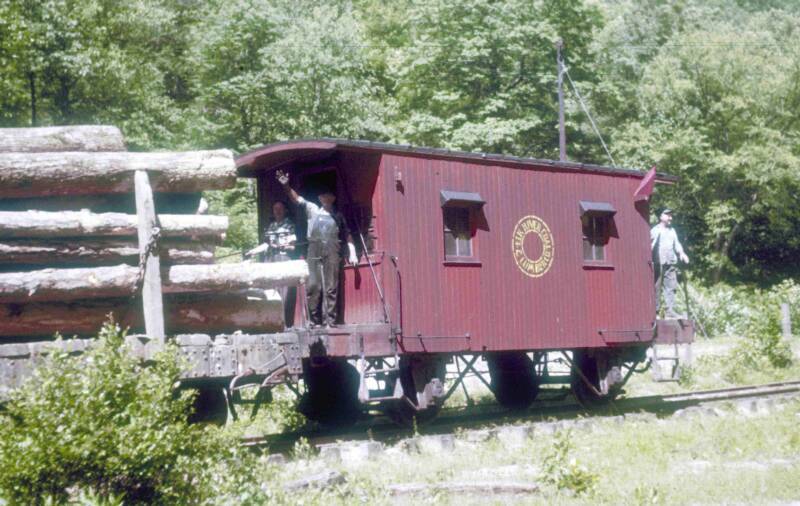 Before I started working on this website, I thought telling the story of the ERC&L logging caboose would be easy. However, as I got into it, things were not so clear. Below is a photo from page 58 of Warden's BC&G book. 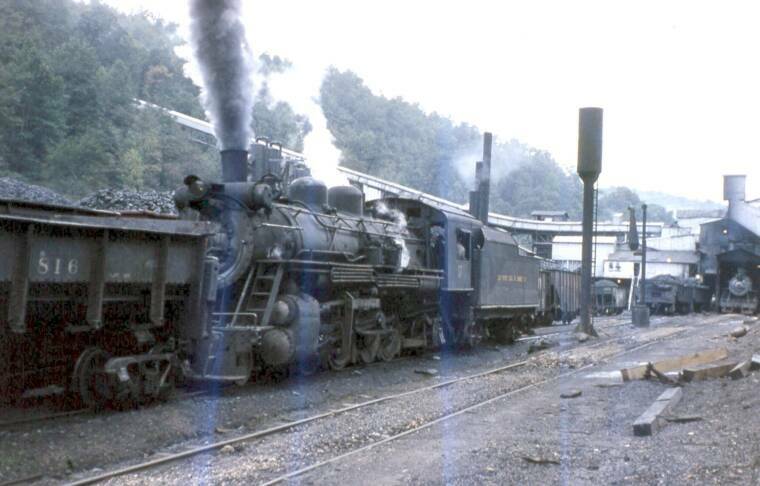 It clearly shows TWO 4-wheel logging cabooses sitting in Swandale at the same time. To the right is a picture that seems to show the caboose that is in the rear of the Krause photo. It has a ladder up the back and appears to be similarly weathered. The Warden book refers to it as the "original ERC&L hack, bought secondhand from the old Coal and Coke". 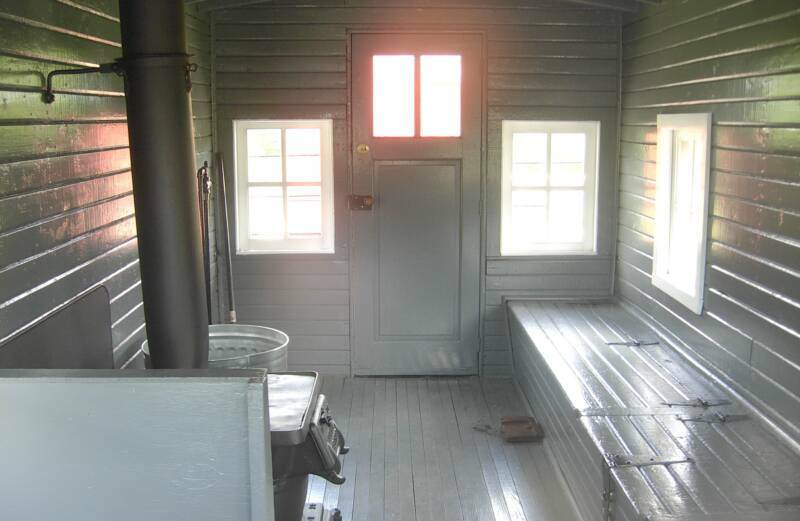 These two photos are the only two photos of this caboose I have seen. One very interesting observation was made while inspecting the caboose at Cass. The structure supporting the axles at the two ends of the car are not the same, as shown in the two photos below. One end has a primarily cast bearing holder while the other end is fabricated from strap iron. Cody Burdette believes that the axle configuration change was made in the '50's at Swandale. 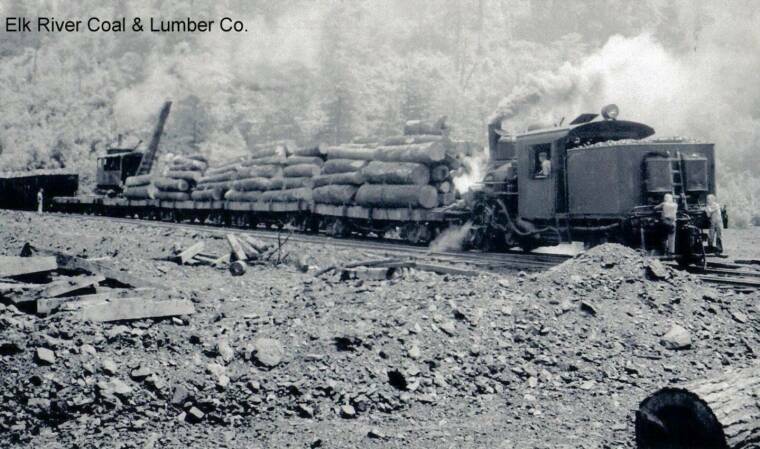 I have found no documentation, other than photos, related to the flat cars in service on the logging activity. Two types appear in the photos. The first are truss rod flats with archbar trucks such as the ones that appear in the early, but undated, photo to the left. 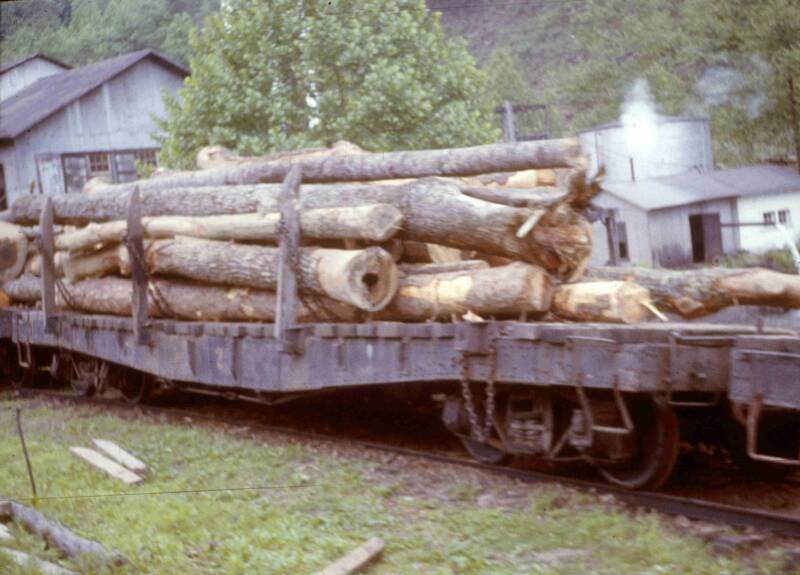 It seems that these same type of cars, perhaps the very same cars, were in use in the 50's and 60's on the "steel train", having been replaced in logging service by conventional 'fish belly' flat cars such as the one in the photo below. I have not seen a photo or any reference to the use of 'logging disconnects' by the ERC&L. While not exactly rolling stock in the traditional sense, I didn't know where else to put the information about the American Hoist & Derrick crane that the ERC&L used to load logs. 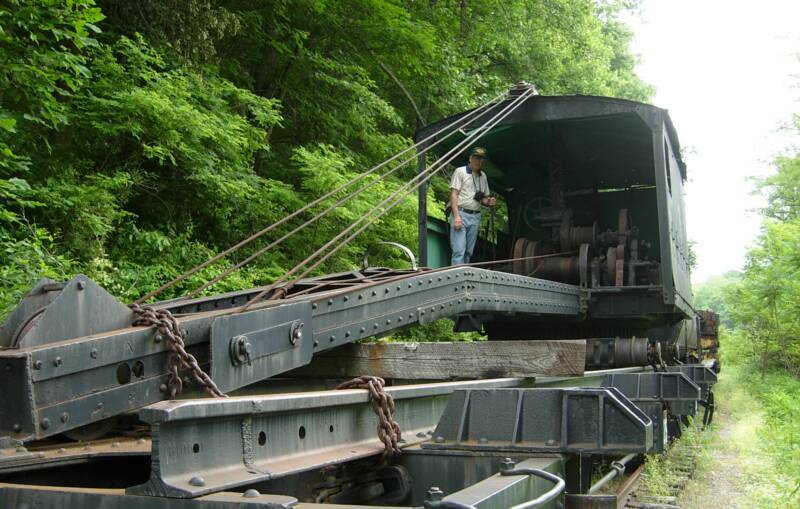 There are a number of photos of the American loader in action on the ERC&L Operations page. Here are a couple of clear photos that show the loader in some detail. The one to the left was taken by David Marquis and the ones below by Brooks Stover. All three were taken at Cass Scenic Railroad. There are also several commercially produced VHS videos with footage of the loader in action. All three of these photos can be enlarged by clicking on them. There is excellent information for the modeler between the three pictures. 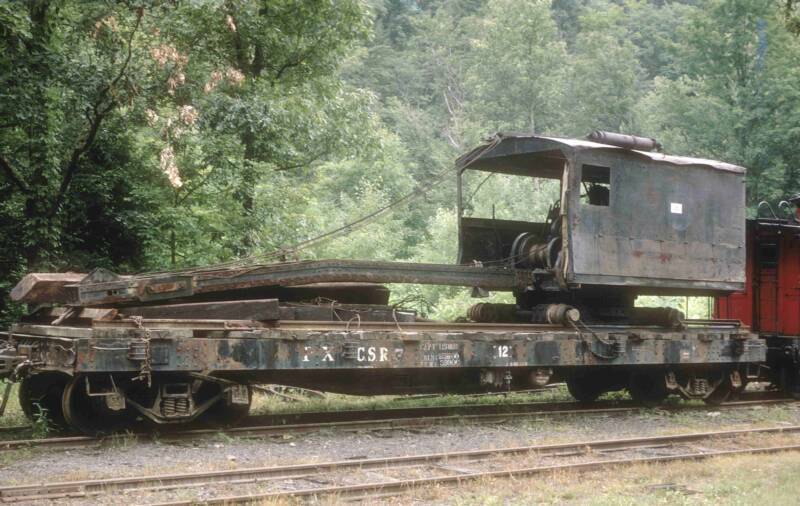 Cody Burdette notes that according to the book COAL & COKE RAILWAY by Alan Clarke, that road had twelve 4-wheel cabooses that looked like this one. 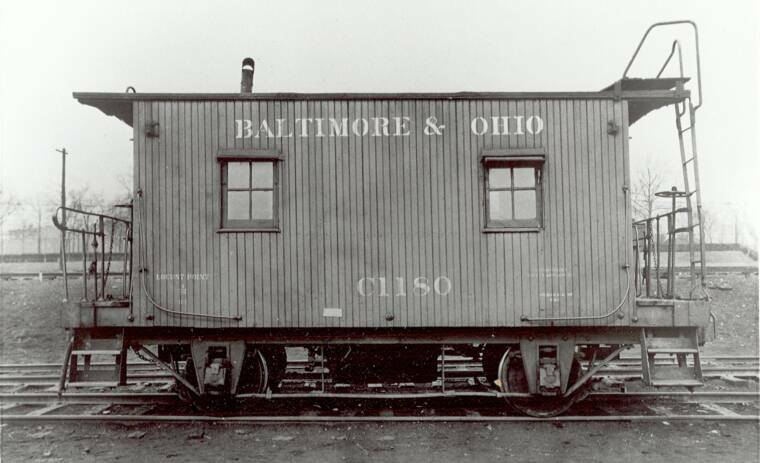 By January 1922, the B&O had taken over the C&C and renumbered the cabooses C1700-C1711. Further, the book says that the cabooses lasted until 1934 when the first was scrapped with the last being scrapped in 1954 "although one was sent to the BC&G and served on that line until its demise." 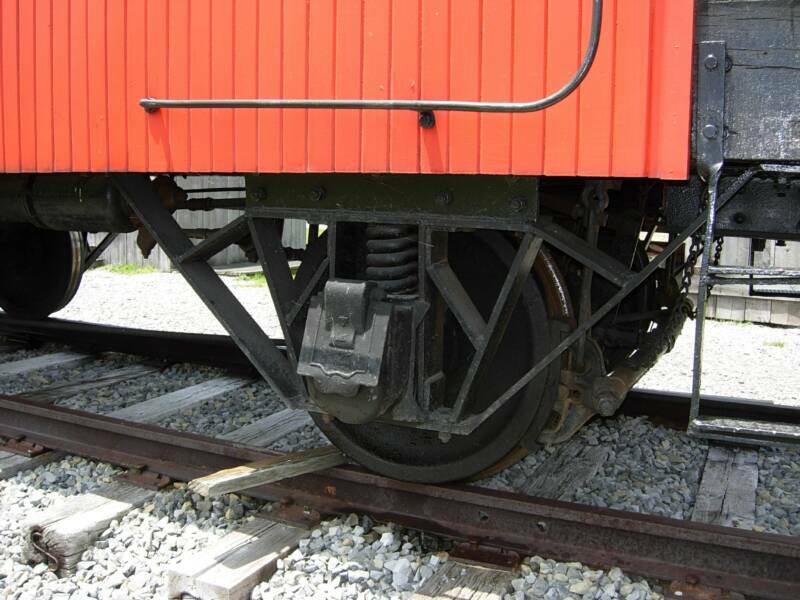 That this is an ex C&C caboose is further reinforced by the curved side grabirons. It would have had a 13'-3" wheelbase and a length of 21'-1 3/4". 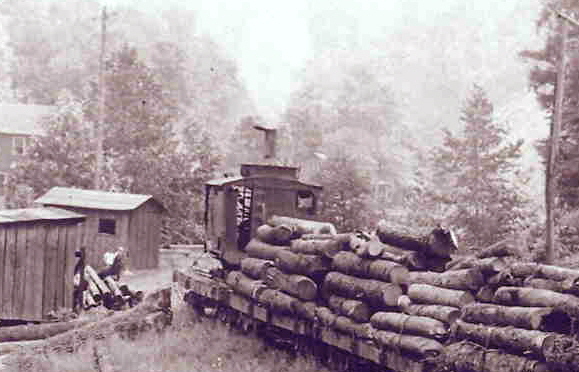 This is a rare photo of the American log loader in its orginal steam-powered configuration. The boom and overall size certainly would support this is the ERC&L loader in its early years. The photo is from Doug Andre's collection. Doug points out that the flat cars are riding on Fox trucks. 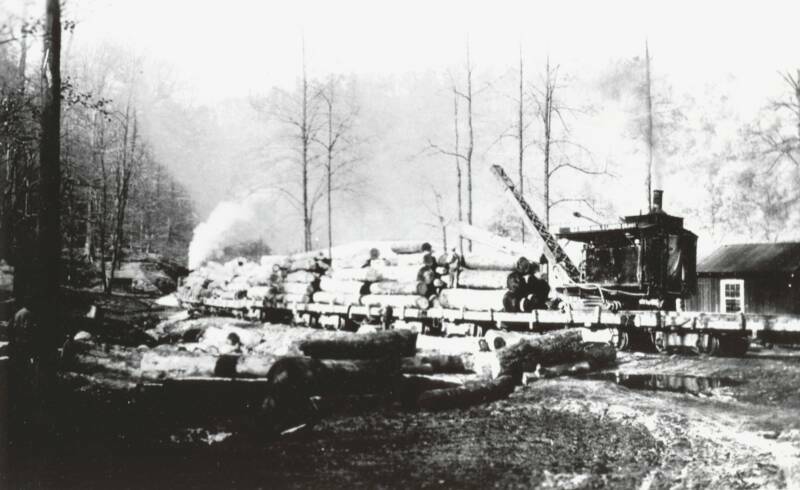 To the left is an enlargement of a portion of an early photo of the Swandale log pond from Elvin Frame's collection that also shows the steam-powered version of the American loader. 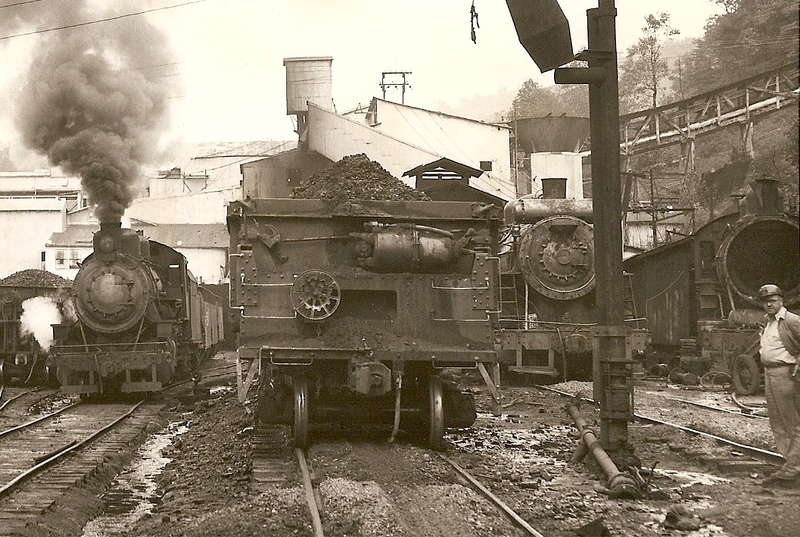 These two photos, from the collection of Loretta Johnson Samples include images of the American loader when it was steam powered. The location is not known but the ground litter suggests they might have been taken near the same location. In both photos there are hoppers visible in the background. Perhaps these photos are of the same train. There are indications that logging was done beyond the Widen mine at one time. Cody Burdette has reported that the stack on the steam-powered loader was hinged and had to be lowered in order to pass under the tipple. Perhaps these photos were taken near the mine or the gob pile. Date unknown. John Taubeneck has provided some information on the loader that appears at the far right of this photo. It is a Barnhart Loader. These were built by Marion Steam Shovel Co. and are named for Henry Barnhart, co-founder and engineer of Marion, who developed them. 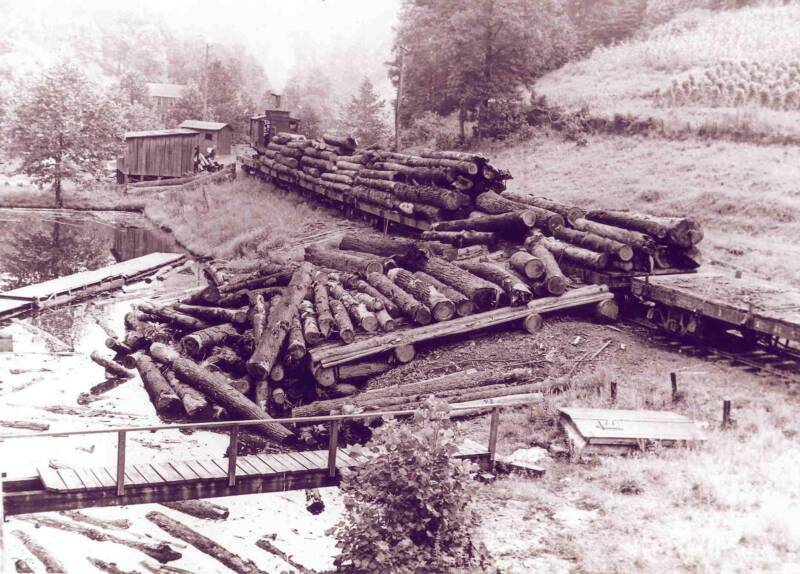 Records show that the Cherry River Boom and Lumber Company owned several Barnharts. 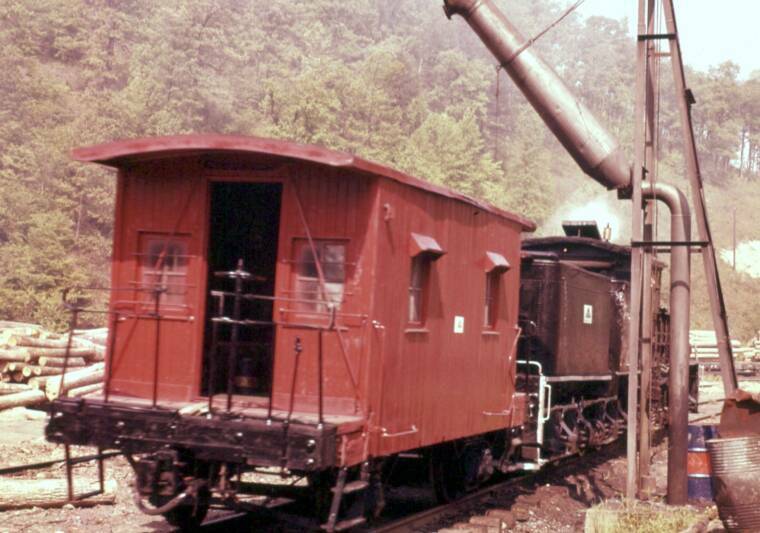 The CRB&L was bought out by the WM Ritter in 1959 and the loader in the photo came to the former ERC&L at that time. This photo was taken before Dec.1963 when the Rich Run Mine closed and so may have been taken between 1959 and 1963. This photo, taken in the winter of 1959 on the Widen gob pile, was provided by Theodore Griffith. 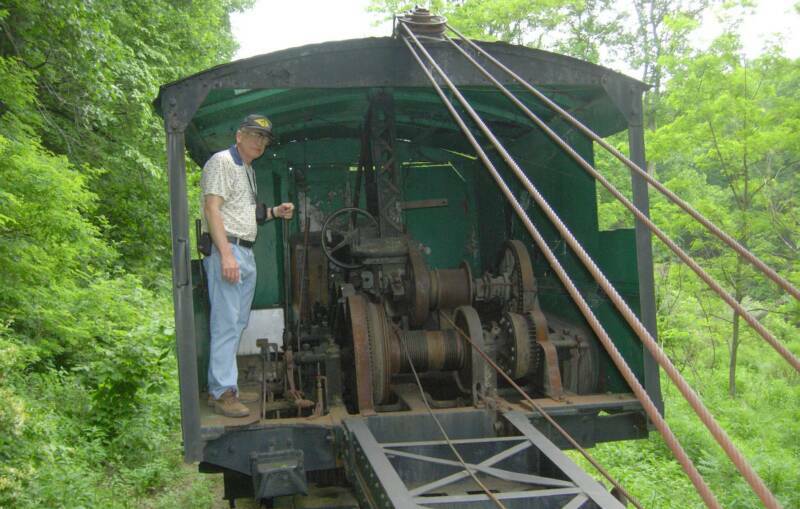 Theodore, his brother Mark, and his son Mathew have done some research on the piece of equipment and believe it to be a Jordon Rail Slag Spreader built between 1917 and 1921. Further, they believe it was originally built to spread slag and ballast for Pennsylvania steel mills. It apparently was used by the ERC&L to spread gob at the Widen pile. Theodore indicates the locals always referred to it as the 'gob spreader'. The large tank in the center of the machine stored compressed air (provided from the locomotive) which was used to swing out the 'wings' of the spreader (shown here folded back). These arms spread and leveled the gob dumped from the Clark side-dump gondolas. Theodore suspects that the engine behind the spreader is #15, the same engine shown on page 73 of the Warden book. Notice that the engine is derelict and without cab or stack. The youngest boy standing on the front of the spreader is Theodore's brother Dave and the other boy at the front is Theodore's other brother Mark. At the back of the spreader just visible in front of the engine is Charles Johnson, the brother of Loretta Samples, a regular contributor to the website. Before this photo, I had never seen any reference to the ERC&L having a Jordan spreader on their roster. Thanks so much to Theodore for providing this truely rare photo! 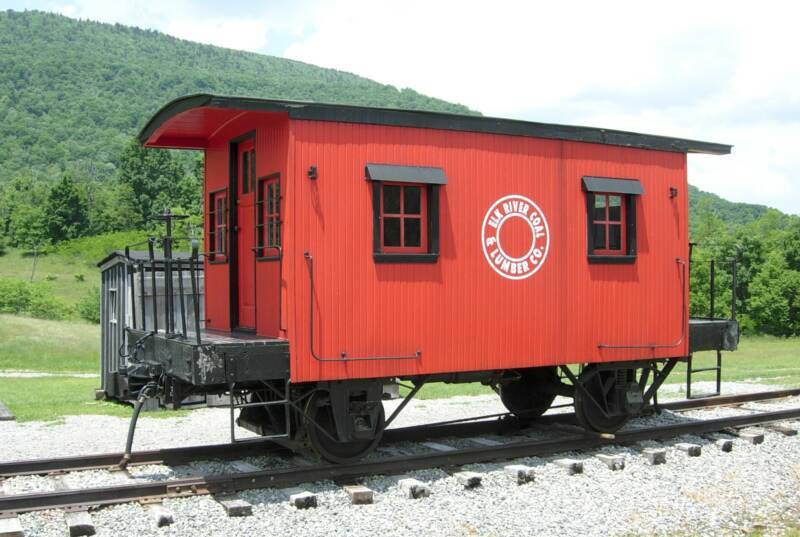 The caboose had three owners in pretty short succession. Soon after the ERC&L sold the logging activity to W.M. Ritter, that company was absorbed by Georgia Pacific. The John Phillips photo from June 1963 shows the caboose, freshly painted, sporting its new GP logo. John Phillips took this photo in October 1958. For the modeler the simple numbers that appeared on the sides of the cars are visible, also visible in the Marquis photo above. 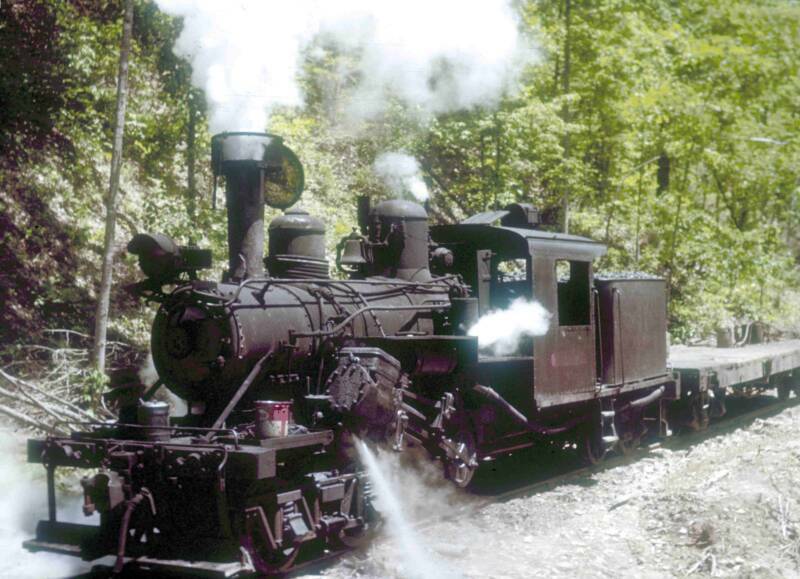 At first glance it appears this is a picture of #17 and should be placed on the motive power page. It could have been. But this is very rare photo. It is the only color photo I know of that shows one of the Clark side-dump gons in gob service. 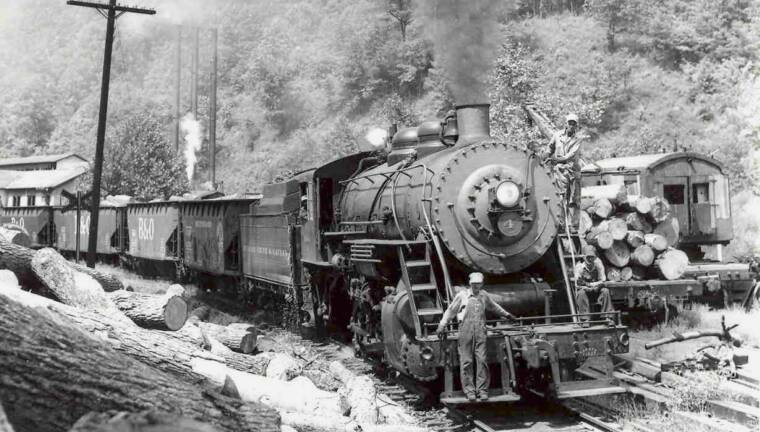 There are several color photos of this type of car in BC&G MOW service, but only black and white photos have been available up till now of gob trains. This photo was taken in October of 1958 by John Phillips. This photo does raise a question, however. The Railway Registry indicates that this car was a BC&G car, not an ERC&L car. One explanation is that the car is actually not in gob service in this picture even though it's coupled to a gob engine. Ed Kirstatter has provided this drawing of the B&O K-1 series of cabooses. 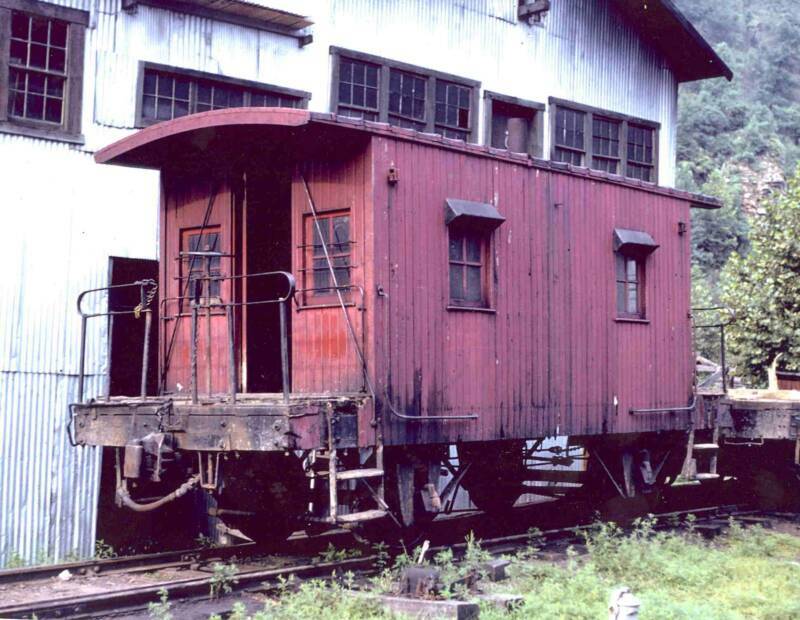 Notice that the cabooses originally were equipped with cupolas. According to the note in the lower right of this drawing there were 900 of these K-1 class units. Notice the handsome circular ERC&L logo on the Marquis photo. Cody Burdette has indicated his dad painted the logo on the car. The date and photographer are unknown, but this photo shows all the detail on the end of the Clark side-dump gondola. It also shows how full the cars were apparently loaded. Also of interest is how this photo captures the overall scene at Widen...not exactly a place you'd want to be walking around in! For more information on the Clark gondolas, go to BC&G ROLLING STOCK - MOW. 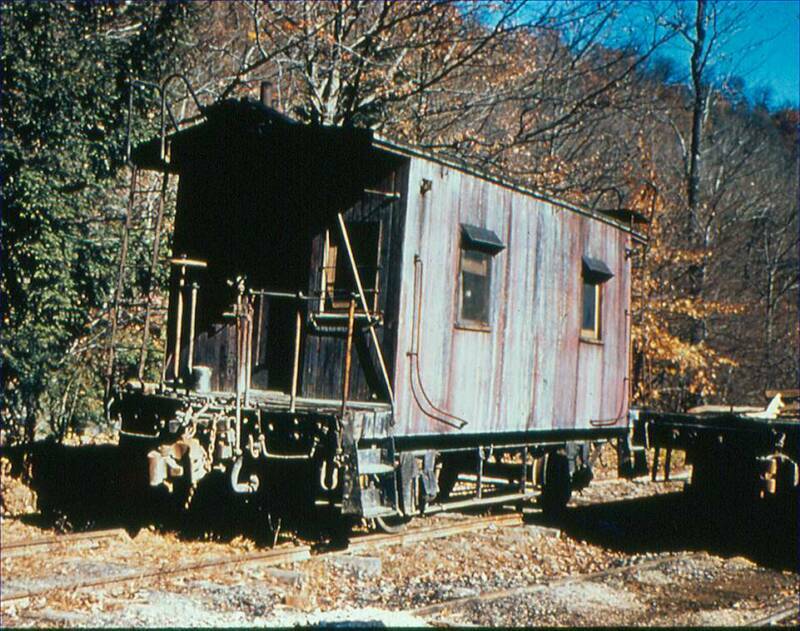 Cody Burdette says that this caboose belonged to Raymond Davis, engineer of #3, and that it generally was stored at Starchers camp where Raymond lived in it. It only came to Swandale when #3 needed service and as Cody recalls it was never painted. 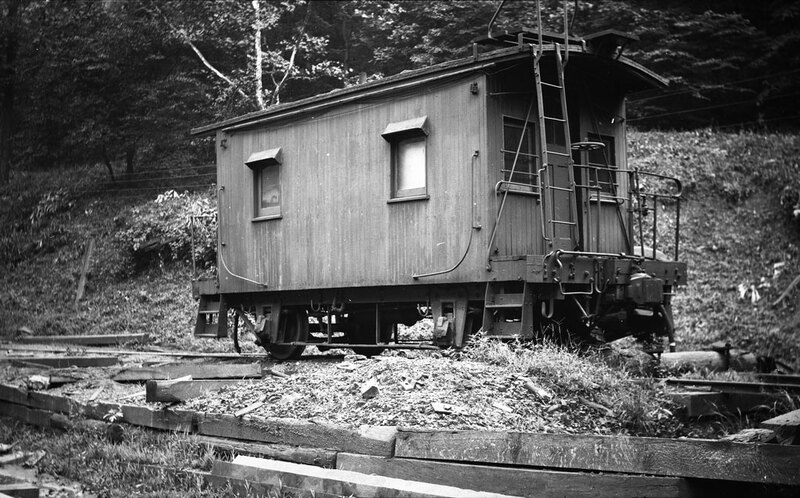 In the summer of 1958, James Greene visited the BC&G and captured this image of Raymond Davis' caboose. In this view the caboose appears to be in very good condition, even if not painted. 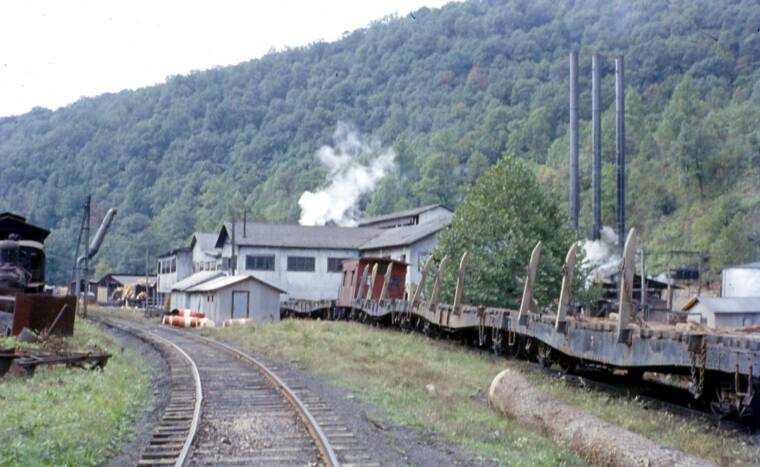 Frank Fieler visited the ERC&L operation in March of 1962 and captured this nice image of the CRB&L crane and the logging caboose plus a number of log flats sitting at Swandale. In the foreground is a BC&G hopper now relagated to MOW service. Notice the yellow panels one each end.